Note that the summer minimum sea ice extent (Fig. 3 below) does not correlate with the global distribution of polar bears (Fig. 2 above). 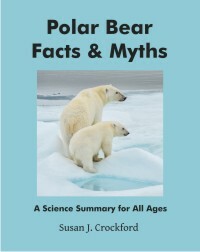 The global range of polar bears is defined by the winter maximum extent of contiguous sea ice, not the summer minimum. In other words, the changes in summer sea ice extent documented since 1979 have not had any effect on the overall range inhabited by polar bears. Fig.3. 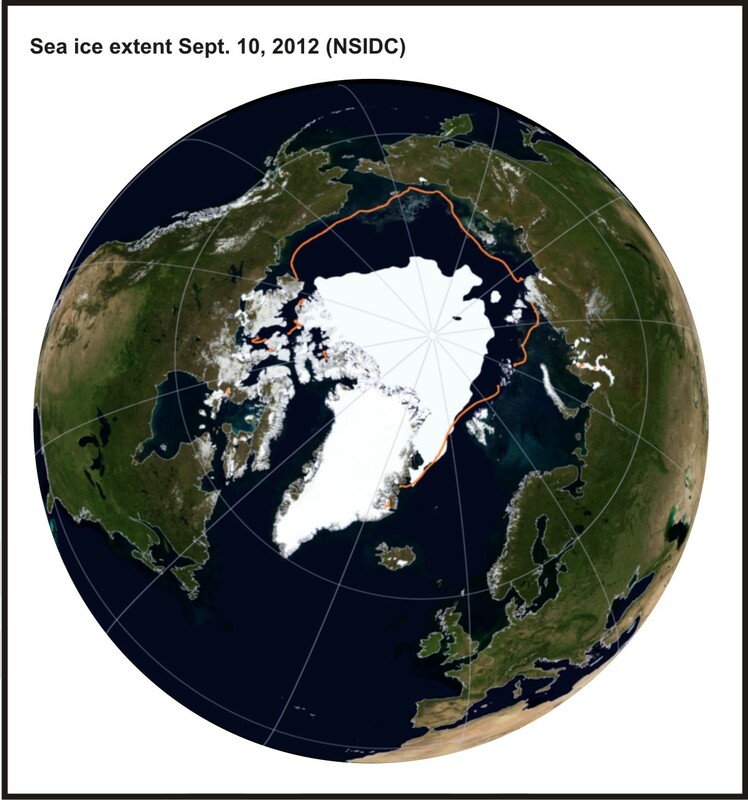 Compare the summer sea ice extent shown here (at Sept. 10, 2012, close to the annual minimum) to the total range of polar bears in Fig. 2. Click to enlarge. Being well distributed across its available range is a pattern we expect to see in a healthy population of any species (Abbitt and Scott 2001; Borregaard and Rahbek 2010). As I noted in a publication of mine on another marine species, the Pacific bluefin tuna (Crockford 1997:22), “when abundance decreases, the range of a species often contracts.” But there is no sign of that phenomenon in polar bears. 1. 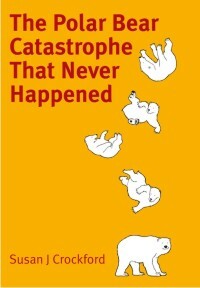 Polar bears do not currently live in the Sea of Okhotsk (Russian Far East, behind the Kamchatka Peninsula) and there is no fossil or archaeological evidence to suggest they ever did (see previous post here). That’s a bit surprising because virtually all other ice-dependent seals that provide food for polar bears in the rest of the western Arctic do live there – ringed seals, bearded seals, ribbon seals, and spotted seals are all rather abundant in the Sea of Okhotsk (Boveng et al 2008, 2009; Cameron et al. 2010; Kelly et al. 2010). 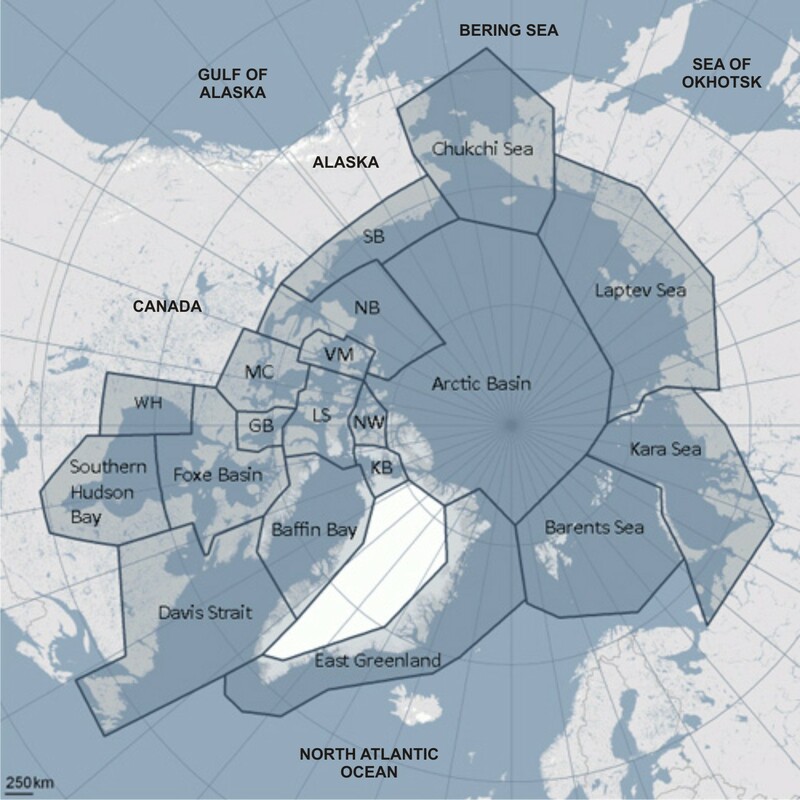 Although there are suggestions in the Russian literature that an occasional polar bear ‘visitor’ has been sighted in the Sea of Okhotsk in the past (Vereshchagin 1969:31), sea ice in the western Bering Sea rarely wraps around the Kamchatka Peninsula and this seems to have been an effective barrier to polar bear populations expanding into the Sea of Okhotsk. Vereshchagin, N. K. 1969. The origin and evolution of the polar bear. Pages 25–53in Bannikov, A. G., A. A. Kishchinskii, and S. M. Uspenskii. 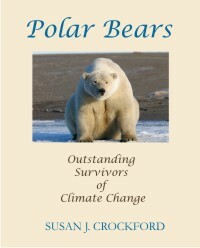 The Polar Bear and its Conservation in the Soviet Arctic. Hydrometeorological Publishing House, Leningrad, Russia. 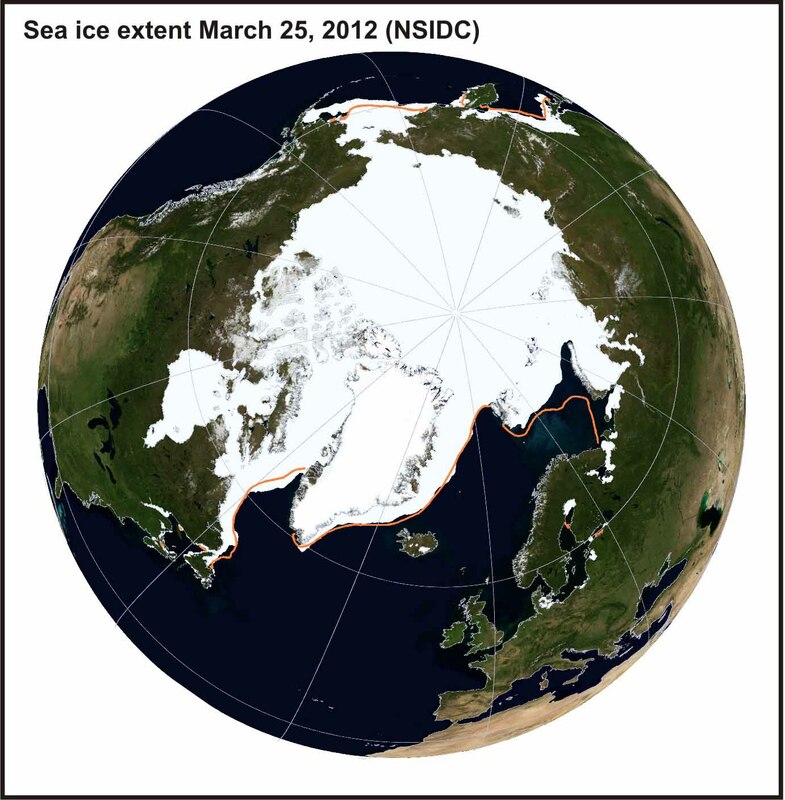 This entry was posted in Population, Sea ice habitat and tagged distribution, population size, sea ice extent, Sea of Okhotsk, summer ice minimum, winter ice maximum. Bookmark the permalink.